There’s lingering uncertainty in Southeast Asia even as military advances are made against the militant group. WASHINGTON, D.C. – This week, the United States hosts the latest in a series of meetings of the Global Coalition Against ISIS in Washington, D.C amid lingering uncertainty in the campaign against the militant group. Despite the expected progress in the military campaign against ISIS strongholds in the Middle East, anxieties remain both in Washington and in Southeast Asia over what those gains mean in the context of the broader campaign as well as the effects this could have on other regions of the world. Since the formation of the Coalition back in November 2014, the group has grown to comprise 72 members and a series of working groups covering what officials define as the full range of aspects of the campaign from stabilization all the way to counter-messaging. The Middle East remains the Coalition’s focus in terms of the military campaign to defeat ISIS in its twin strongholds in Iraq and Syria. And there continue to be inroads made on this front despite the fierce struggle that ISIS has put up. On Sunday, for instance, Iraqi Prime Minister Haider al-Abadi entered the city of Mosul to declare victory following a nine-month battle to take back the place where the group’s leader, Abu Bakr al-Baghdadi, proclaimed the so-called “caliphate” three years ago. But as I have pointed out previously, for Southeast Asia in particular, which remains a key front in the battle against ISIS, advances against ISIS in the Middle East are a bit of a mixed blessing (See: “ASEAN’s Islamic State Conundrum”). While taking on the group where it is based and depriving it of territory is crucial to damaging its brand, fighting ISIS at its base also increased the likelihood that other regions, including Southeast Asia, may become either a new home for ISIS recruits or an alternative target for attacks. As it is, over 1,000 fighters have flocked from Southeast Asia to join ISIS in Iraq and Syria. The group even has a Southeast Asia unit, Katibah Nusantara (Malay Archipelago Combat Unit), which now comprises around 700 fighters, largely from Indonesia, Malaysia, and the Philippines but also a few from Singapore as well, according to Malaysian defense officials. And apart from a string of planned attacks in Southeast Asia, fears that the group could be looking to establish a territorial foothold in the subregion have only risen with the siege in the southern Philippine city of Marawi (See: “What Did the ASEAN Trilateral Terror Meeting Achieve?”). As of now, Southeast Asian states Malaysia and Singapore are the only countries from the subregion that are part of the Coalition, with Indonesia and the Philippines being notable absences. Like other countries within the Coalition, each country tends to play a role within the broader campaign, with Malaysia’s so far largely coming in the area of counter-messaging (See: “Exclusive: US, Malaysia, and the War Against the Islamic State”). Within the Asia-Pacific more broadly as the Coalition defines it, there are six other members – Afghanistan, Australia, Japan, New Zealand, South Korea, and Taiwan. The Coalition meets at various levels in a series of regular meetings. The last major meeting for Coalition foreign ministers was hosted in Washington, D.C. in March, and the last meeting at the political directors’ level took place in Berlin, Germany last November. The meetings this week has been designated as being at the senior officials level. The Diplomat understands from representatives from countries attending that they will consist of a series of both formal discussions and briefing sessions as well as more informal meetings occurring on the sidelines. The formal meetings planned will occur over three days, U.S. officials have said. 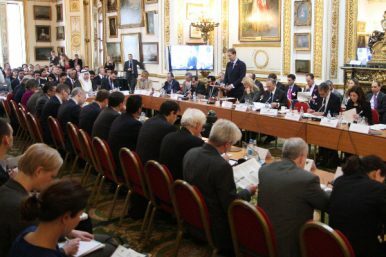 On July 11, the Coalition Working Groups on Counter Finance, Foreign Terrorist Fighters, Stabilization Support, and Communications will meet individually to discuss progress and next steps in each of these areas. Then, on July 12, the full 72-member Coalition will meet for discussions on how to accelerate efforts to defeat ISIS, both within the remaining territory it holds in Iraq and Syria as well as its branches, affiliates, and networks globally. Finally, on July 13, the Coalition’s Small Group – consisting of about 30 key Coalition members – will meet, synthesizing the work done over the previous days and build on recent progress in Mosul and Raqqa to work towards ISIS’ defeat. Despite the general consistency in the Coalition’s meetings, there tend to be special sessions and activities that occur along the way as well. For instance at this meeting the Coalition Small Group has invited representatives from a number of African countries, the African Union, and the Multi National Joint Task Force (MNJTF) to attend a special session about the Islamic State threat in the Lake Chad Basin region in West Africa. Ahead of the meetings, this week, Malaysia’s Defense Minister Hishammuddin Hussein captured the anxiety among some Southeast Asian states when he said Malaysia was on the highest alert for militants fleeing to the subregion following the liberation of Mosul. Meanwhile, U.S. officials have been echoing lingering concerns heard among some members of the Coalition about both the continued need for a comprehensive focus even amid military gains and the impact of these advances on other parts of the world. “The meetings are taking place at a key moment in the fight against ISIS,” Heather Nauert, a State Department spokesperson, told journalists at a briefing last Thursday, just as the liberation of Mosul was occurring. As the campaign against the group intensifies in the Middle East, Southeast Asia is reacting with predictable ambivalence. Indonesia, Malaysia Boost Military Ties in Islamic State Terror FightWhere Is the New ASEAN ‘Our Eyes’ Intelligence Initiative Headed?What’s Next for the Sulu Sea Trilateral Patrols?What’s in the New ASEAN Armies Workshop?Where Is Malaysia’s New Counterterrorism Center in Its Islamic State Fight?